Craving for tasty, fried chicken that's tender and juicy but not greasy? 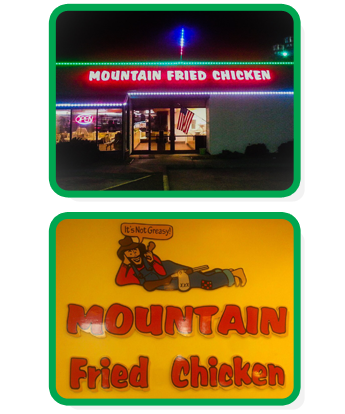 Look no further than Mountain Fried Chicken, the number one family-style restaurant in Winston-Salem, North Carolina. 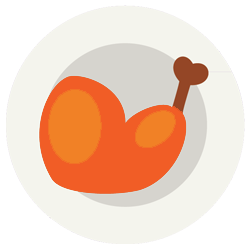 Serving the most delicious, fall-off-the-bone fried chicken in the Piedmont Triad, we bring you home-style chicken dishes with a choice of 14 different vegtables! Don't believe us? Visit any of our locations and try our famous fried chicken and our original "Winston wings" today! "It's not greasy"
At our family restaurant, we bring you homestyle delectable dishes in a cozy casual atmosphere. A dining experience like no other. Family-friendly restaurant Mountain Fried Chicken in Winston Salem, North Carolina, has been serving lip-smacking fried chicken and wings in the Piedmont Triad since 1987. Offering a casual dining experience, this family-owned restaurant serves all-American dishes that'll remind you of home. We currently have four stores in the area with our team ready to serve you with a smile. 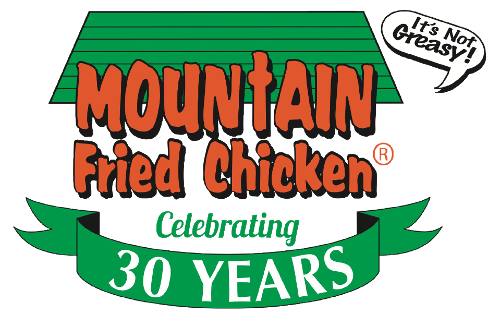 Mountain Fried Chicken has been operating for more than three decades under the guidance of our founder, Charlie Taylor, known to the locals as "Chicken Charlie". With our experience and expertise in the food industry, we have steadily grown from a humble diner to four full-size restaurants. In fact, we are celebrating 30 years of monumental mountain goodness, and we hope you join us for many more. With our success, we do not forget to give back to the community. We've achieved this by contributing to charity programs, and supporting causes we believe in such as: youth programs, community outreach, cancer/diabetes research, and our Armed Forces Veterans. In addition, as a member of the Rotary Club of Clemmons™, District 7690, since 1998, we are long-time sponsors of programs like the "Rotary Hand-in-Hand" project at Agape Faith Church™. We were also a contributor of the "CP3" Winston-Salem's Weekend Church Social. Monday – Sunday: 10:30 a.m. – 9:00 p.m.
Monday, Tuesday, Wednesday, Sunday: 10:30 a.m. – 9:00 p.m. Thursday, Friday, Saturday: 10:30 a.m. – 10:00 p.m.